We sell a wide range of Jet pieces, both rough and polished. See below for our categories, and scroll further down for information about the stone. This includes mineralogical information and some about crystal healing, too. 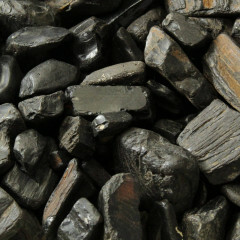 Jet is a type of Lignite, otherwise known as Brown Coal. It is usually either a very dark brown or black, and is formed by decomposing wood from millions of years ago. As trees naturally fell, they washed down rivers into the sea, where they sank. They were buried under layers of sediment, sand, stone and other materials over the years, and slowly compressed into Jet – similar to the formation of Coal. Jet is pretty much exclusively used as a gemstone, or as a mineral sample for collectors. The main use is for jewellery, as it has been throughout history. It is also sold carved and polished, as it is very easy to work with. This material has been used for ornamentation since antiquity. The name ‘Jet’ comes from the French ‘Jaiet’, which came from Latin – which came from Ancient Greek! The term ‘jet black’ derives from this lovely black material, too. It was widely used for decorative jewellery by the Romans and the Vikings. It later came back into popularity with the Victorian age, when it was used for mourning jewellery. Jet has been carved for at least 10000 years; so this certainly isn’t a complete list! In the modern day, Jet is primarily used for jewellery, and is popular with the gothic subculture – a large Gothic festival happens in Whitby every year. Jet is found in several places around the world. By far and away the most famous is Whitby, UK. It can also be found in Mongolia, Poland, Portugal, Russia, Spain, Tibet, and Turkey. I’m sure this is not an exhaustive list! Jet is quite a soft ‘stone’, measuring between 2.5 and 4 on the Mohs scale. The specific gravity is around 1.30 to 1.34. The easiest test is to heat a pin up to a decent temperature – ideally red hot or hotter. When you touch the hot needle to the piece, true Jet will give off a smell similar to burning coal. The streak of these pieces should, ideally, be a deep chocolate brown. Obviously, make sure to use white ceramic streak plates. If you have a decent microscope with over 150x zoom magnification, you may be able to see the wood grain. I have only tried this on polished pieces and did not have much success, though. The only hazard we have found from Lignite is that burning it as fuel causes pollution. There are two varieties of Jet, hard and soft. Hard occurs due to saltwater, soft due to freshwater. Only hard Jet is suitable for using in jewellery, really. Jet is rarely treated, other than cutting and polishing. Some pieces may be stabilised, but there is no great shortage of jewellery quality material worldwide. 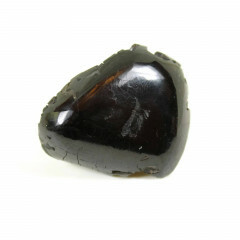 Similar to Amber, Jet can become electrically charged when rubbed. This has contributed to the name ‘Black Amber’, which is unfortunate as there are darker coloured Ambers typically referred to as black Amber. This material is thought to be good for purification of the soul, and for drawing out negative energies which may be affecting you. You can think of Jet like a filter – helpful for those who are experiencing negative energies or emotions. Jet can be used to cleanse other stones and crystals, too. People who are especially empathetic may want to consider carrying a piece of Jet with them, in order to ‘desensitize’ themselves. Elixirs containing Jet are thought to help ease anxiety, increase your self awareness, and help you to increase your psychic abilities or clairvoyance. Typically, this is used with the Root chakra, as it has a deep connection with the Earth. Typically, this stone is associated with the Zodiac sign ‘Capricorn’. Jet can be combined with Lepidolite in order to fight stress and anxiety. It can also be combined nicely with Amber or Petrified Wood, due to the nature of both of these stones. 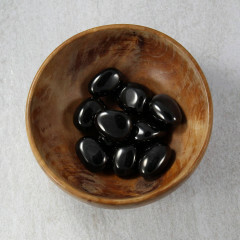 Some people suggest combining Jet with Black Tourmaline or Smoky Quartz to aid in psychic protection.